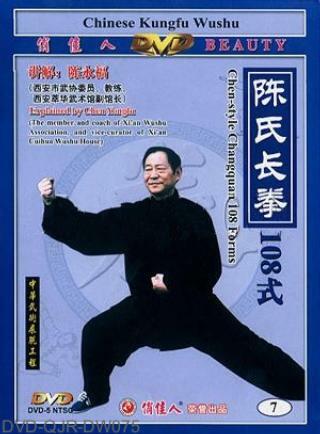 The Chen-style Taijiquan which based of the Chen-style Changquan 108 Forms is created by Chen Wangting after absorbing strong points of various styles of wushu schools. Until Chen's family 12th generation, the Chen-style disciple Guo Yongfu who mastered the long-style boxing routine of 108 forms, (someone said that his primary name is Chen Bufu, but his name following his mother was changed for Yongfu later) because his errantry so that manslaughter people, escaped Hongdong county in Shanxi province, then long-style boxing (that is Tongbeiquan of Shanxi province, or "Wu Ji Chanquan" in Taiyuan city) was handed down there. After that, the Chen-style Changquan 108 Forms was lost in Chen's family. In 1975, Taiji master Chen Liqing paid a visit to Xu Fangqing in Sanxi province, and learned the Chen-style Changquan 108 Forms from him.